Fritton Owl Sanctuary07951786069work Educational VisitsFritton Owl Sanctuary can be found just behind Fritton Plant Centre in the village of Fritton near Great Yarmouth. This very small owl sanctuary provides shelter and care for unwanted and injured owls, where possible rehabilitating sick native owls to release them back into the wild. Entrance is free, however donations are encouraged to ensure the work of the sanctuary can continue. Conservation and education are a top priority. Each enclosure has carefully written details about its inhabitant, with details about their usual height, weight and life expectancy, as well as information about their natural habitat. 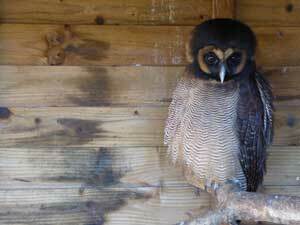 Owls currently staying at the sanctuary include European Eagle, Burrowing, Boobook, Barn, Little, Snowy, Asian Brown, African Spotted, Bengal Eagle and Tawny. School visits are welcome, or else some owls can travel to your school or educational establishment. Please contact Louise or Mark for further information about what might be possible for your class or group..
Fritton Owl Sanctuary can be found just behind Fritton Plant Centre in the village of Fritton near Great Yarmouth. This very small owl sanctuary provides shelter and care for unwanted and injured owls, where possible rehabilitating sick native owls to release them back into the wild. Entrance is free, however donations are encouraged to ensure the work of the sanctuary can continue. Toilet facilities are available in Fritton Plant Centre. Light refreshments are available in the Plant Centre's café from March to October. Open 10am to 4pm, 7 days a week. Please check before visiting over festive periods/holidays. Please contact us directly to arrange educational visits for adults and children. Take the A143 out of Great Yarmouth signposted towards Beccles. Follow the road through to the village of Fritton and the owl sanctuary is located on the right, within Fritton Plant Centre, just beyond Fritton Lake Outdoor Centre.